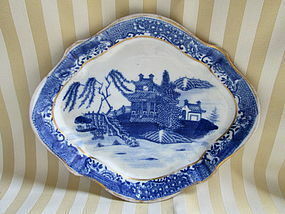 A Chelsea plate, heavily potted with the three stilt marks on the bottom and a small gold anchor. 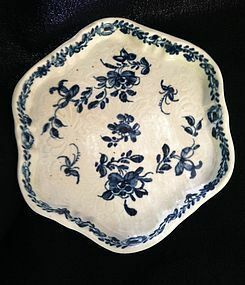 The outer edge with small molded waves and the inner edge of the plate rim with larger ones. On the rim the gilding and the blue decoration accentuate this motion (don’t get seasick). The bird, resting on a branch with green leaves and red berries is painted toward the upper side of the plate. 8 ¼ inches (21 cm diameter). 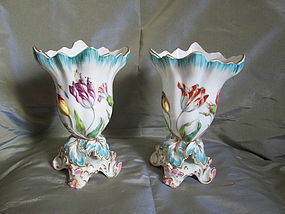 The vases, English from circa 1850, sit on a rococo style attached base with light blue and gilt molded leaves for the base of a fluted and molded vase with a flaring and serrated top rim. 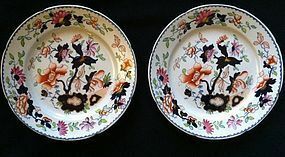 The molded flowers are painted in bright enamels. The porcelain is bright white. Both have a sticky label on the underside for the Hackman Collection with the Number,”80” presumably an inventory number. They are 6 inches tall and 4 inches at the widest. 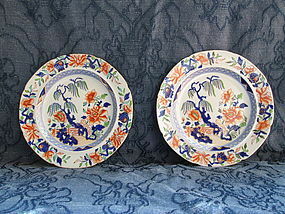 A pair of Mason's Patent Ironstone China plates circa 1820 in the "Chinese Wall" pattern with Under glaze blue and over glaze enamels with gilt highlights on the green border and the dots on the wall which is painted with different color blocks. The mark, “Mason’s Patent Ironstone China" is impressed in a single line on the back of the plates. Diameter is approx. 9 inches (22.9 cm). 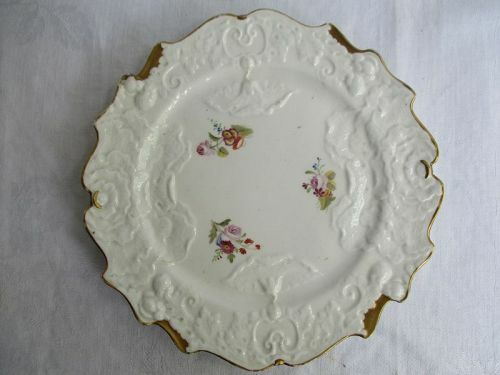 An elaborately molded plate with three hand painted sprigs of flowers. 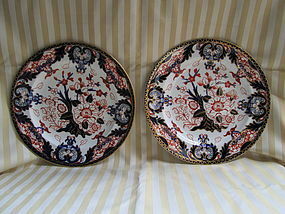 The pattern is one that was made by CJ Mason circa 1825 in the rococo revival taste. 8 ½ inches diameter. Condition: Minor gilding wear and a few knife scratches, but otherwise no chips, cracks, hairlines or repairs. A hexagonal Worcester teapot stand circa 1760 with molded chrysanthemums overlaid by blue painted blossoms which are repeated in a garland formation on the interior rim. Diameter is approximately 5 inches (12.7 cm), and height is approximately 5/8 of an inch (1.6 cm). Condition: Slight discoloration on bottom. No chips, cracks, or repairs. The teapot stand is an attractive shape with a nice contrast between the painting and molding. 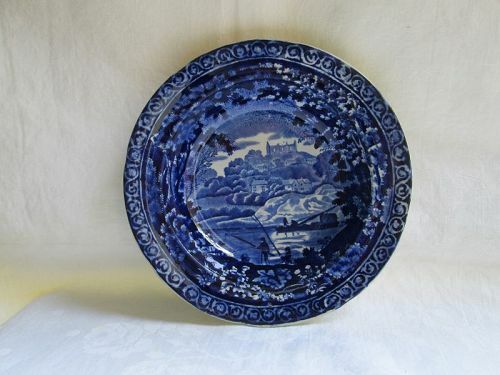 A dark blue printed soup plate depicting in the center Saint Catherine’s hill in Surrey with fishermen and a boat on the River Wye. The back marked with an impressed Clews mark. Well printed and clear images. 8 ¾ inches diameter, 1 ¾ inches tall. Condition: No chips, cracks, hairlines or repairs. A few minor scratches in the center of the bowl. Slight discoloration on the back. 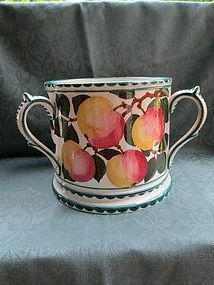 A large tyg with hand painted apples and leaves with green dental banding and green dashes on the three handles. The tyg, or loving cup, is a popular form for Wemyss. Marked with impressed “WEMYSS WARE” in an arch over “R.H.&S.” 7 ½ inches tall, 87/8 inch diameter at base. Handles are about 2 ¼ inches out from the body. 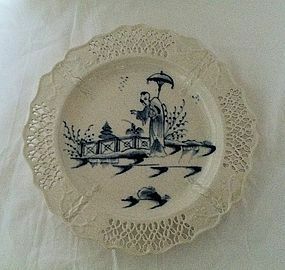 A very nicely molded Leeds creamware plate with underglaze blue decoration of an oriental man standing beside a low fence holding a parasol in one hand and pointing with his other while the birds fly in the sky beyond. Impressed mark that reads, “EDS*POTTERY.” 9 ¼ inches diameter (23.5 cm). Condition: no chips cracks hairlines or repairs. The glaze is crackled and feels slightly rough on the back. 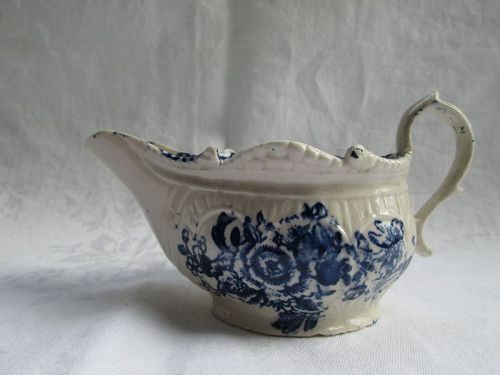 An elaborately molded high handled sauceboat decorated with blue transfer flowers and blue transfer border on the interior top edge. There is a large amount of kiln ash in the glaze. 5 ¾ inches (14.5 cm) long, 3 ¼ inches (8 cm) tall and 2 ¾ inches (6.5 cm) wide. 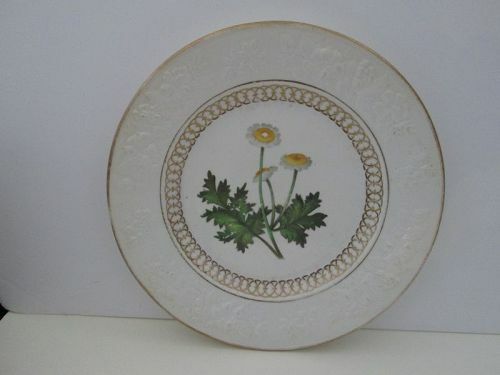 A soft paste porcelain dinner plate unmarked, but probably Minton. In the “feuille de choux” pattern with hand painted flowers, blue accents and heavy gilding. These knock offs of 18th century Sevres were popular from the mid 19th century (c.1850) onwards and Minton made many of the very good ones. 9 ½ inches (24 cm) diameter. Condition: no chips, cracks, hairlines or repairs. This plate looks as if it was never used. 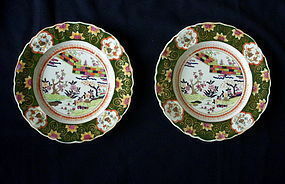 A pair of Ironstone plates with Chinese style decoration of a willow tree, a Chinese fence and flowers. 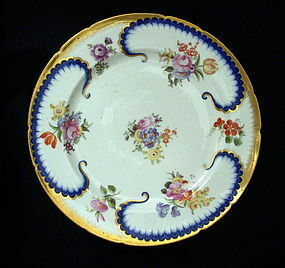 With a lobed edge they have an elaborate border between the rim and the center of the plate. The blue is underglaze decoration while the colors and gilding were applied after the glaze. 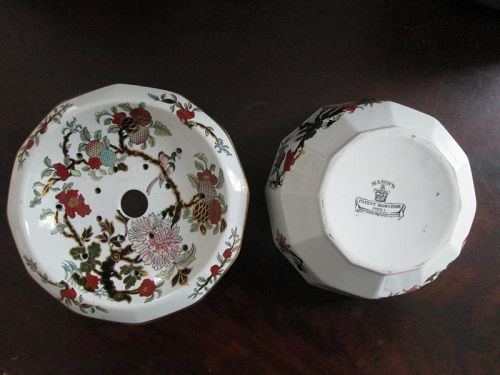 The underside with the Royal Warrant, “STONE CHINA/No. 7.” 8 ¼ inch (21 cm) diameter. 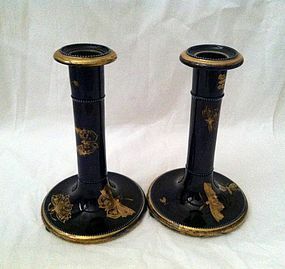 A pair of candlesticks with a dark blue ground decorated with gilt insects and raised beaded rings. Though unmarked this is a color and decoration that was made by Masons from about 1815 to 1825. 8 inches tall and 5 inches diameter at the base. (20 cm tall and 13 cm diameter at base). Condition: No chips, cracks, hairlines or repairs. Gilding wear around edges and some scratches around the base, probably from scraping off wax. 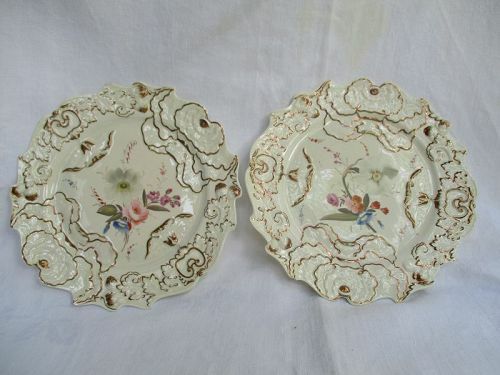 Pair of ironstone plates with chinoiserie decoration of flowering plants with a flower border and thin blue printed scallop border. Back marked with an elaborate blue printed mark of a crown over what looks like a log with a garland of flowers and a ribbon with the words, "TONQUIN CHINA." The pattern number '500' is written in orange on both plates. The factory is unidentified. Diameter 8 1/2 inches (21.5 cm).